The Americans took California away from Mexico with the Treaty of Guadalupe Hildago. It officially became the 31st State to join the Union on September 1, 1850. With that came disputes of land ownership. In order for the families who owned land to keep it, they had to show valid proof of their land holdings, as well as maps and documentation. Many families could not show their proof of ownership, since the Spanish and Mexicans parceled out land freely. These families lost their land holdings and it reverted to the State, which then sold it at a very cheap price to ranchers and farmers. Sometime in the 1860's there was an awful drought that killed much of the cattle and livestock that was being raised in Orange County and the entire Southland for that matter. Many of the ranchers and farmers went bankrupted, and they were forced to sell their land to pay off their debts. One individual who came at an opportune time to take advantage of this situation was James Irvine. He came to California during the Gold Rush to mine for gold. However, he became disillusioned and went to San Francisco to enter the grocery business. He earned a considerable amount of money, with which he was able to invest in real estate. So along with Benjamin and Thomas Flint and Llewellyn Bixby, James Irvine was able to acquire much of the huge Rancho San Joaquín in the center of the county, totaling 120,000 acres or about a fifth of Orange County. He gained sole ownership of the ranch in the 1860's. On his ranch he grew a variety of plants that were more drought resistant, and the Irvine Ranch became a very successful enterprise. There is one interesting story that comes to mind involving James Irvine. In the 1880's when railroad building was very rapid, Collis P. Huntington (owner of Southern Pacific Railroad) wanted the right of way to build his railroad through Irvine's vast ranch, connecting Los Angeles with San Diego. His previous attempt though the Temescal Valley in Riverside County was unsuccessful, as a flood washed the tracks away a few years after they were completed. However, Irvine refused to grant the railroad owner permission to build through his land (this was a very audacious thing to do, since most communities actually paid the railroads to build through their land, and right of way was usually given). Apparently the reason for Irvine's refusal dates back to the late 1840's, when he and Huntington were on the same ship to San Francisco. A disagreement ensued and they have been on unfavorable terms since. In the mid-1880's, James Irvine I died, but his son James Irvine II also opposed Southern Pacific's wishes to build (due to SP's high tariffs). So one Saturday when the courts were closed, Southern Pacific sent workers to begin construction through the Irvine Ranch. They workers were met with Irvine's ranch hands armed with shotguns. The workers became scared, left, and never returned. Eventually, Irvine allowed Southern Pacific's rival, Atchison, Topeka, and Santa Fe (specifically AT&SF's subsidary, California Southern RR), to build their railroad through the Irvine Ranch. Other people came with a different intention in mind: to settle the land. Orange County was still a part of Los Angeles County at that time, and there were several individuals who bought land and offered it to settlers for a cheap price. The first successful settlement was Anaheim. 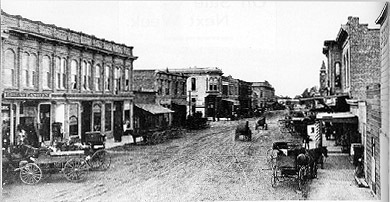 It was laid out by George Hansen and Charles Kohler, and the settlement of Anaheim largely attracted German immigrants in the late 1850's through the 1860's. The name Anaheim stands for the home next to the Santa Ana River, with "Ana" coming from Santa Ana and "-heim" meaning home in German. This new settlement was successful: most of the settlers grew plants and crops, but others grew grapes with the intention of making wine. And indeed wine was produced in Anaheim. But the settlement needed a port from which they could ship their goods to the outside markets as well as receive goods. The answer was Alamitos Bay, located today between Seal Beach and Huntington Beach. However, a couple of years after the building of a small port there, the course of the San Gabriel River changed and deemed Anaheim Bay no longer a good port. There were other settlements that were important during this time period in the 1870's. 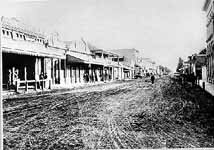 Santa Ana developed after the first colony of Anaheim. It was envisioned by a man named William Spurgeon. He got the stagecoach line that ran from Los Angeles to San Diego to make a stop at his new settlement, complete with a goods store and a post office, which greatly increased the publicity afforded to his new community. And people did come to settle in Santa Ana, and its importance was getting close to that of Anaheim. Other important settlements included Tustin, Fullerton, Orange, Newport Beach, and Huntington Beach. 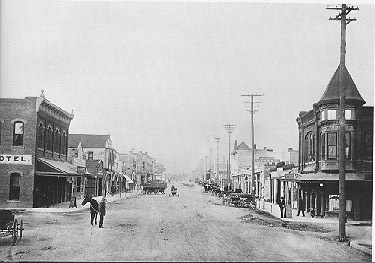 Tustin was founded by a guy named Columbus Tustin, but the town never got to be as important as nearby Santa Ana, mostly because the stagecoach line would not stop there. But it grew quickly with the introduction of the railroad. Fullerton was conceived by the Amerige brothers, who named their new town after the man who lent them the money to start it. Mr. Fullerton didn't want the honor, but the brothers decided to name it after him anyway. 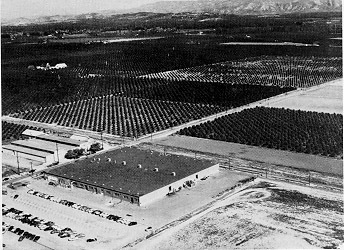 Fullerton soon became an important stop, and housed some important industries. Orange was the brainchild of two lawyers: Andrew Glassell and Alfred Chapman. The two lawyers received the rights to the land as a payment for services rendered to a client. They wanted to name it Richland (to imply the rich fields where settlers can grow their crops), but there was already one in California so they couldn't. Finally they decided on Orange, which was the county in Virginia where one of the two men was born. It is interesting that the beautiful Orange Circle is where Glassell St. and Chapman Ave. intersect. And that circle is where Orange all began. Newport Beach was a small town by the coast. There was a guy by the name of McFadden who build a wharf on the peninsula there, along with a railroad from Santa Ana, to haul goods to and from the coast. McFadden was a religious man who refused to work on Sundays. The wharf was successful, but he was getting pressure from Southern Pacific Railroad (owned by Collis P. Huntington and his nephew, Henry Huntington) to sell that line to them. McFadden refused because he disliked the dishonest business practices of Southern Pacific. So instead he sold it to another party, which turned out to be a Southern Pacific decoy. That line that McFadden build ended up in Southern Pacific's hands about three months after the sale, and the railroad was taken out. Newport mainly served as a docking place, and is noted because of its natural bay, even though the entrance to the bay is very dangerous. Huntington Beach was originally called Pacific City. Philip A. Stanton founded the settlement, but it was built as a resort city, just like Bay City (Seal Beach) a couple of miles up the coast. Pacific City along with Stanton's Bayside Land Company was bought by the Huntington Beach Company in 1903. The leaders of this new town knew that in order to get customers coming in to buy the land near the beach, they had to get the railroad to their city. So they struck a deal with Pacific Electric Railway Company to bring their electric trolley system through their city, and in honor of the owner of Pacific Electric (Henry Huntington), they renamed the city Huntington Beach. And on July 4, 1904, a huge celebration was held and many people came to Huntington Beach to see the fireworks, the nice coastline, to eat free food, and to buy the cheap land that was readily available. The Pacific Electric line was later extended down into the community of Newport Beach and the Balboa peninsula. That community paid Huntington "compensation" for bringing the railroad into the resort town and also gave him free right-of-way. Today, the line that went from Long Beach to Newport Beach is gone. It went along the beachfront (today's PCH) and down into Balboa peninsula on the middle of Balboa Blvd. You can still visit a "red car" on old tracks close to downtown Seal Beach (off Electric Ave.). There were other settlements that were not as successful as those listed above. There was much land speculation going on at that time and most of the time people didn't buy the land or there just wasn't enough capital to get it going. Such settlements include Carbondale in the Santa Ana Mountains, Fairview with its hot springs in present day Costa Mesa, McPherson in present day Orange, St. James north of Orange, Bolsa four miles west of Santa Ana, Delhi two miles south of Santa Ana, Carlton near Yorba Linda and Olinda, as well as Olive, San Juan by the Sea and Atwood.